If you’re hosting a bridal shower, birthday party, or even just a get-together with friends, a crepe bar makes an excellent addition to the festivities. Whether you choose to create the crepe making station yourself or opt to have it catered, crepes are a fun and delicious meal or snack option that departs from the usual selections. Having an interactive station with a variety of ingredients allows each guest to come up with ideas for their very own delicious sweet or savoury crepe flavours. To set up your own crepe bar, consider the fillings you will be including. Are you looking to have a dessert-themed menu? If so, mousses, chocolate, creams, sweet spreads, syrups, and fruit like sliced bananas and berries are great choices to lay out for your guests to choose from. If you prefer to have your crepe bar as a lunch or dinner option, sliced meats, vegetables, cheeses, and sauces or spreads like salad dressing, cream cheese, hummus, or mayonnaise provide a variety of choices that let your guests get creative. As for the actual crepes themselves, there are two methods most often used when it comes to making them at home. The first method is to pour some of your crepe batter into a greased frying pan and swirl the pan until you’ve created your crepe. It may take some practice to get the right amount of batter and the technique correct, but once you’ve figured it out, you can create many crepes quickly this way. The second method requires the use of a crepe spreader. These are those “T” shaped wooden devices used to help spread the batter around evenly. With this method, you choose a flat surface that you can heat up, whether you have a griddle, or you use the bottom of a flat pan, pour in some of your batter, and then use the spreader to create an even, smooth crepe. Make sure you hold the spreader straight and work quickly, or you could end up with uneven or overcooked crepes. When you have finished making your crepes, keep them fresh by layering a sheet of wax paper between each crepe. This helps to prevent sticking and ensures that when they are ready to be used, they are soft, easy to roll, and ready for all of your favourite fillings. If you prefer the simplicity of catering, Crepe Delicious is more than happy to offer our crepe catering services for your next party. 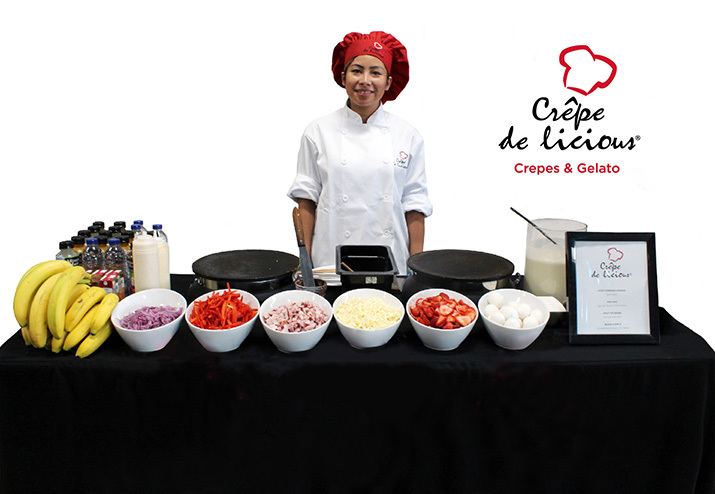 For each event, we bring a crepe station and experienced crepe chef to your location to create fresh, delicious, and unique meals for your guests. You can choose from a selection of crepes featured on our menu, or each guest can combine our ingredients to create their own unique and delicious crepes. Consider crepes for the menu at your next party. Browse the menu at Crepe Delicious to choose what you would like to include on your list and visit a location near you to come in and discover your favourites!